The Scoville Meter is used to test the 'fire' in a sauce, salsa or other food. Mr. Scovie was an early 'pioneer' in spicy foods, and the Scovie awards are named for him. Our Emergency Survival Kit won the 1st Place Scovie Award in the Gift Box category at the National Fiery Foods and BBQ show for 2001. The Texas Shootout takes place in Austin, Texas every August. The competition is fierce and the stakes are high! Our Blazing Hot Salsa woke everyone up... 1st place in the Habañero Salsa category. 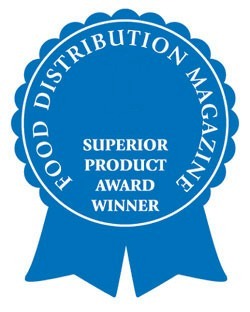 Each year Food Distribution Magazine, one of the industry's best publications, holds a competition for the best food products on the market today. Competing with 800 sauces from throughout the nation, our Chipotle Bar-B-Que Sauce won 2nd place and was named a Superior Product. The Texas Shootout takes place in Austin, Texas every August. The competition is fierce and the stakes are high! Our Three Pepper Bar-B-Que Sauce took 3rd place in the Hot Bar-B-Que Sauce category. The Texas Shootout takes place in Austin, Texas every August. The competition is fierce and the stakes are high! Our Search & Rescue Chili Mix took 1st place in the Chili category.